The days of anyone buying Hikvision from anywhere off the Internet are numbered, at least in Europe, if Hikvision's plan comes to fruition. 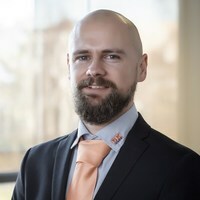 In this note, we examine Hikvision Europe's plan, comparing it to the Americas, the debate the European plan has triggered, and the potential winners and losers of this move. Cutting out online sales: Pricing will no longer be allowed to be disclosed on online stores. Plus, only authorized Hikvision dealer / integrators will be allowed to buy from online stores. 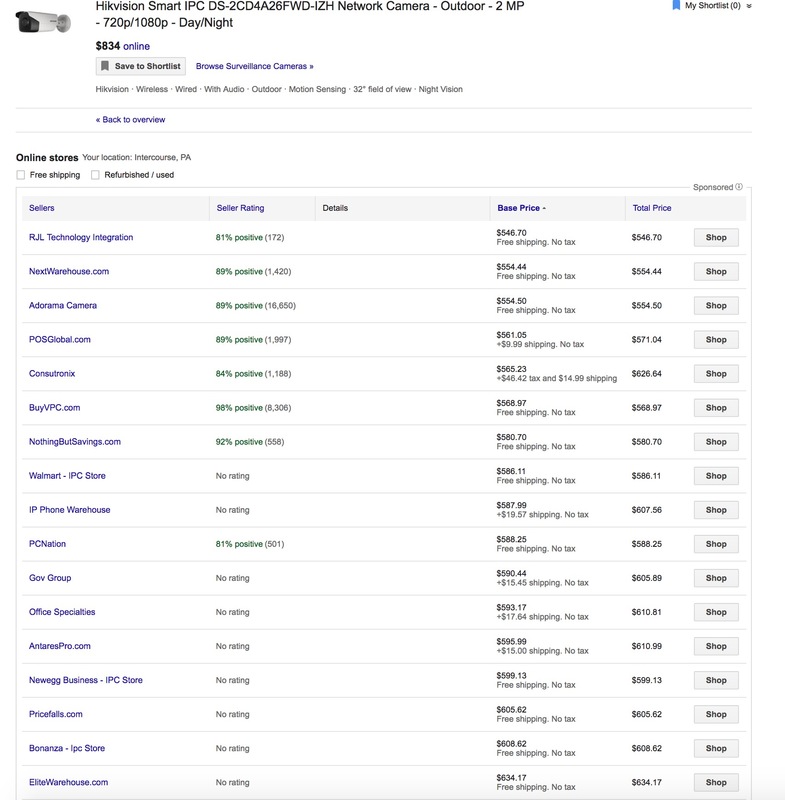 Introducing HiWatch, a lower end Hikvision offering, historically offered in developing countries, will be available for sale to anyone online, at notably lower prices but with markedly lower capabilities. Not allowing pricing online and restricting purchasing to authorized dealers is a major change and is atypical in the video surveillance industry, where most brands are loosely controlled allowing easy location of pricing and purchasing online. This is a clear benefit and boost to Hikvision's authorized partners as it will make it harder for end users to price shop or to buy Hikvision from low cost, low support rivals.  Not only would it help partners but it could increase the brand recognition of Hikvision as a limited, higher end offering that is not available from any random source. This is no easy task given the large volume of Hikvision distributed from China and from other sources around the globe. From what we have seen, the HiWatch products will be lower total resolution (4MP), no H.265+, no true WDR and overall limited to more basic feature sets. The UK also has Hikvision Ezviz, though they currently have only consumer oriented cameras, unlike the US that has full kits. It has been made clear to us that we will not even be allowed to supply further HikVision-branded products to our existing customers with existing systems, nor to fulfill open quotations that we have provided to recent enquirers. HikVision have introduced this ‘new global strategy’ with ridiculous haste. 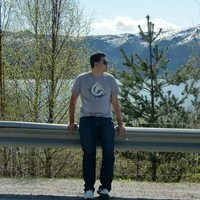 HiWatch products are not even available in the UK yet. We anticipate that these changes will cause their brand a lot of ill-feeling, when customers learn that they can now purchase HikVision-branded products only from Trade Installers. Additionally, Use-IP questioned how Hikvision could accomplish this online restriction given the broad availability on eBay UK, etc. Later, a debate amongst UK professionals on LinkedIn covered the same topics - pro and con. Dealers benefit from restricted product. It reduces competition and allows them to increase their margins. If Hikvision can follow through with this, and that will not be easy so it should be simply assumed, there is a lot of upside to build greater loyalty with larger and more sophisticated dealers. This also fits well with Hikvision's international product expansion to higher end products like the deep learning NVRs, multi-imager cameras, DarkFighter, the forthcoming DarkFighterX, etc. None of those products, given their price and relative sophistication, make much sense available through online stores direct to consumers. Hikvision internationally first achieved success in the DIY / hobbyist / direct purchaser market as early adopters looked for lower cost offerings. Hikvision has built a significant customer base and loyalty among those users. This move effectively cuts them off, driving them to buy from integrators, which these users fundamentally look to avoid given their own technical skill level and desire to minimize out of pocket expense. How large this market is and how that compares to Hikvision's professional market, we do not know. 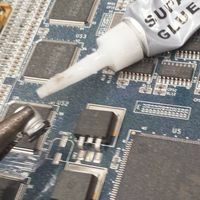 However, if Hikvision can successfully convince more mid to large scale integrators to sell high volumes of much more expensive cameras, we expect that gain would far more than offset the loss in the DIY area. For Hikvision's lower end competitors, this might be good news. The additional barriers that Hikvision is placing for buying Hikvision opens up an opportunity for other companies to fill that void in low-cost, direct to anyone market. Hikvision North America is not following the same plan as Europe. As for HiWatch in North America, Hikvision responded, "We are currently evaluating the product portfolio. Time frame for decision has not been set. We think this is potentially a good move for Hikvision and for the overall health of the industry, as it could simultaneously make Hikvision more of a respected industry brand that does not conflict with itself through selling everywhere and diminish the race to the bottom. On the other hand, Hikvision's overall global channel complexity and historic focus on selling to everyone, present challenges in executing this plan fully. Could they actually be realizing that the race to the bottom is a no-win situation? As with all things, dahua will be following them in this before too long I'm sure. It will be interesting if they go through with it to see if they can be effective in policing the Internet when it's not behind the "Great Firewall". if they can be effective in policing the Internet when it's not behind the "Great Firewall". It certainly is within Hikvision's own control. These are Hikvision products sold by Hikvision, simply through other regions of the world. The question is whether Hikvision HQ is willing to risk / lose those other sales to stop unauthorized sales in Europe. 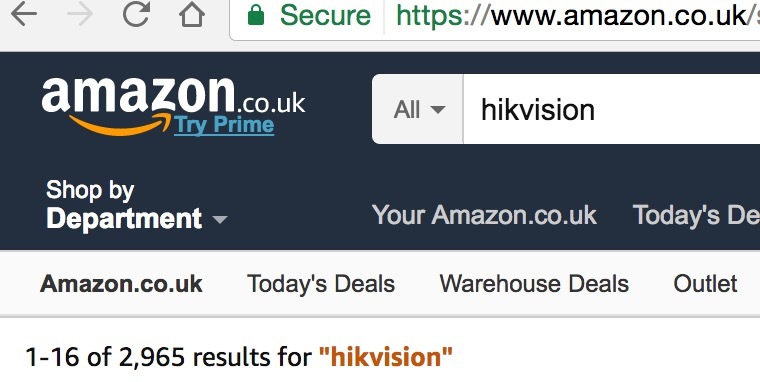 This will be very successful for Hikvision and Hik Dealers if Hikvision can once and for all take care of the Chinese Distributors who are shipping branded TFTP'ed Hikvision products to Amazon's FBA to be sold on the Amazon USA market place. They will also need to block these same Chinese distributors from selling these branded Hikvision products to other distributors in the USA. As said before, this can be done by simply policing the Amazon marketplace. Amazon is only 1 of these mass marketplaces though. A trip to Ali Express will net you the same results if not better than Amazon and good luck stopping that behemoth. Agreed. However I think that marketplace will be much harder to manage since its directly a Chinese company with most everything shipping direct from China. I always thought that if Alibaba openened up some fulfillment warehouses in the USA, then we are in trouble. This all comes down to enforcement strategies. Dahua will need to do the same sooner or later. Hikvision will restrict their low priced "high end" solutions to dealers only. Simultaneously, they will create a new brand of insanely low priced "low end" products and continue to compete with their own dealer base. Hik will mass market their new low end brand on the internet which will continue to drive the race to the bottom and drive Hikvision dealers to justify their prices even more. Then they continue to compete with their own dealer base by OEM to mass merchandiser brands that go direct to consumer and other brands like LTS that have a hybrid manufacturer\distributor model and will be selling to the competitors of Hik dealers who may buy from ADI. On top of that now they must build an enforcement department within their company to police the millions of websites globally that sell their product, which is almost impossible. No disclaimer is going to deter people from getting a cheap price and if they actually negate support for someone who buys from an unauthorized dealer, it will hurt their image even more. But if the low priced products genuinely have worse specifications, Hikvision dealers should be able to compete. From what I have seen of HiWatch, it's clearly inferior and an average dealer should be able to sell that difference. Again, not if the products are not as good. The problem with Hikvision and the race to the bottom so far is that they have been selling professional products to anyone. now they must build an enforcement department within their company to police the millions of websites globally that sell their product, which is almost impossible. I share your skepticism here but not for the same reason. Policing the websites is not hard, even if there are literally a few thousand. They can track serial numbers and trace fairly easily. The challenge that I see is that this means many of their existing distributors / dealers, etc. are going to lose a lot of money, which means Hikvision is going to see revenue declines in other parts of their business. Are they willing to anger so many of their existing partners? Are they willing to take the immediate revenue hit for longer term potential? That is what I am skeptical about. My concern would be that Hiwatch would simply become another product on the market that would find it's way in to installations where it doesn't belong. It will be sold on price only and the usual culprits will use the Hikvision name to market and sell it. The main problem still will be the CN part. If someone wants to buy direct they probably just will sell. Mainly because of not willing to say "no". I always was fighting against cross border selling and Webshop's. If Hikvision wants ten be taken seriously they really need to step up and live up to the promises they make. Still love the products. But price mostly seems to be more important than customer satisfaction. Being the cheapest does not mean being the best. Here it still needs a lot of improvement. And I obtained this wisdom because I have worked here. First, they will have to work on a unified price list for Europe and UK. Today price difference between different regions is up to 20%, for example between UK or East-Europe and West-Europe. They will never be able to control cross border sales by online sites if they do not take care of this, the products are the same. I wont lie, if Hik commits to this, executes and keeps shutting down distributors who violate the policy, I will have a whole new level of respect for them. Bring this to NA and the respect will go up even more. I can not see how this could be anything but good for the industry, to bring margins back. But I will bet my lunch that Hik does not execute fully, and it never comes to NA. He's over on the Hikvision cabling post, defending Hikvision. But I would suspect he would benefit if Hikvision did this in NA. Well it will be good for the EU coffers. Withdrawing sales from people who discount your product is price fixing. The EU competition rules can impose a fine of up to 10% of the companies worldwide annual turnover so Hikvision could be in for one hell of a hand out to support the EU. Should keep Greece going for a year to two! Hikvision here is not doing anything with their competitors but setting terms of who can or cannot sell their own products. Do you have other EU official resources that would help educate us on this point and show how Hikvision might be in violation here? The EU Competition laws are written to protect the average man or woman from being overcharged for goods or services by business that either group together or big businesses that act in way that their dominance can “control” prices. EU competition laws are clear that suppliers must not fix or set minimum resale prices. (Hik could be viewed as now trying to do this) This is referred to as resale price maintenance and is illegal. In essence, retailers should be free to set prices at their absolute discretion. Hik should have controlled its distribution when it was much smaller and it would have then “maintained” its prices. By now using its dominance to try and raise prices to the average man or woman it is in danger of sailing close to the wind of breaking EU laws. Force certaintrading conditions on your business partners. There are laws in place that need to be obeyed, but there is plenty of room to get it done within the limits of the law. If there were (as example) only 2 companies with oil, or even more companies but one with 50% market share, fixing a price is fixing the market price and therefore not legal. Nothing is stopping installers and end users to switch to another brand with a simular product. HIK is not 50% of the market and not the only offering. Next to this Hikvision has many trademarks, images etc that are propietary to them, but are used on various websites. This could be seen as copyright infringement. As pointed out above by mr Dapkevicius, the bigger quesion is will Hikvision have the courage to see it through and not fold if Dahua or other brands seem to take some market share due to this. In the long run it will be beneficial, and easily within EU law. As a Hik Distributor I am hopefull they will see it through. Hik has sales online, but serious project are worth more. To get one you have to sacrifice the other. Hik’s change is without doubt is good for the industry, they have made their products available as DIY which is unfortunately a frequent Eastern style. The Hik salesteam are under pressure for sales and it is this pressure that (in my opinion) creates the wrong choices to whom Hik supply products to. I think Hiks target in the UK is something like £100M p.a which will not be achieved with out saturated market penetration which will mean their products are/will be available “everywhere”. However, they can not set or use their dominance to “influence” what a consumer pays for their product. This is illegal under EU law. If they enforce people to remove online pricing they will be opening themselves up to EU scrutiny. In the last 3 years the EU raise over 8 Billion Euros in fines through Companies who have been found to be anti-competitive. Hik would be wise to get on with “Westernising” their distribution chain but perhaps a little more subtly. #6, thanks. From a limited search of this, I found a number of sources that support this view of EU law on minimum resale prices (e.g., 1, 2, 3). In the US, my experience is that the law is not as strict or interested in such regulation. Will this move push to the background the debates about weak hacking security and the other "pricing" controversy- subsidies from their home government? No, if there is news on any of those fronts we will continue to report it. Also, it still remains to be seen how this unauthorized distributor move will work out, which we will continue to report on. So installers selling Hik systems can finally regain their margin over the client buying direct? Or are they realising that they need to rescue their brand name before it is no better than the spam retailers? The big concern is that HiWatch pushes the race to the bottom even further. There is already one UK site advertising this range to the professional installer. When end users are just comparing pricing it will kill the market. Agree. The "low end" business users will ask rhetorically, because most won't care what the answer really is, "If it's good enough for my house, why not use it for my business?" Anyone on the Hikua bandwagon is probably go to start feeling a lot of pain in their profits soon. I would completely agree Richard. HiKVision had a problem that their product was sold everywhere and had driven prices so low there are sounds of the “jungle drums” of an installer revolt. So what do they do? 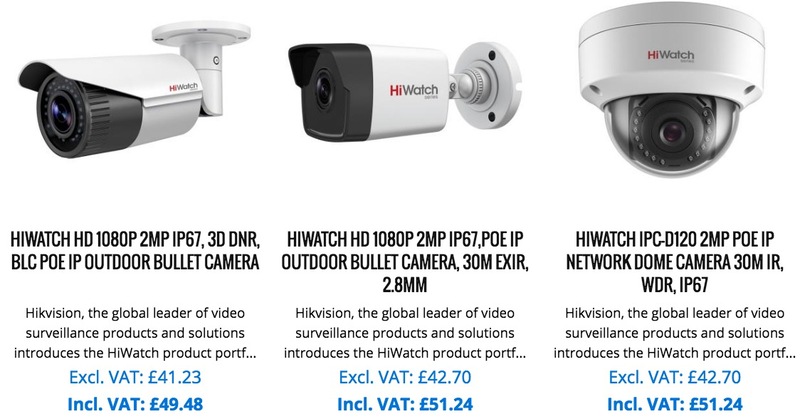 Launch an even lower priced range of products that will be sold online under the banner “Hiwatch by Hikvision” that will compete directly with the installers that are moaning?? This move can only drive prices even lower but expand and make HiKvision’s direct to end-user sales “official” in my eyes. You can’t sell to the trade and the end-users and hope a brand name will distinguished between the two. The public nor trade are stupid. As the saying goes you can’t have your cake and eat it.